After much anticipation and an extended first season for the Sydney premiere production of this acclaimed modern musical, I was thrilled to be able to see one of the final shows of In The Heights at The Hayes Theatre. In review … where do I start?! The performers had me hooked from the word go. The staging was intimate and full of character, the choreography was dynamic, the humour was perfectly timed and the band was on fire! This little show packed a whole lot of punch. The brilliantly written story was so heart-warming as we were taken into the lives of The Washington Heights community, sharing their stories of love, loss and laughter. The Hayes Theatre was filled with uplifting Latin rhythms that were so catchy I found myself having a little boogie in my seat numerous times! The casting was spot-on. Every single performer brought oodles of talent and their own brand of magic to the stage. Ryan Gonzalez (Usnavi) charmed and rhymed his way into the audience’s hearts, whilst the incredible Olivia Vasquez (Vanessa) was so passionate and captivating that it was hard to take your eyes off her. Timomatic (Benny) was smooth and the comedic timing of Ana Maria Belo (Camila) was pure genius. A huge congratulations to the creative team who keep going from strength to strength throughout this show. Director Luke Joslin, Musical Director Lucy Birmingham and choreographer Amy Campbell have done a brilliant job adapting the musical to the very intimate Hayes Theatre. Amy Campbell’s dynamic style and energetic choreography really brought the show to life, and filled the whole theatre with a positive, lively vibe. It’s no wonder that the show sold out in the first week! 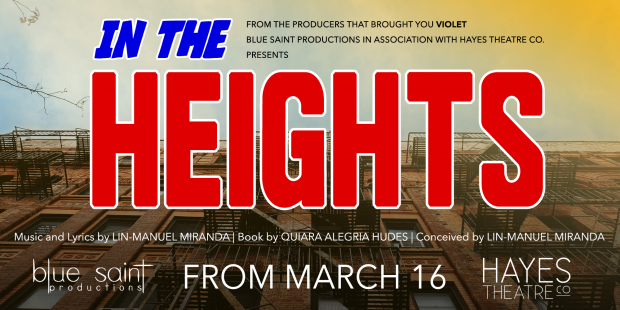 The good news is that if you missed seeing In the Heights this time round, rumour has it that it may be hitting the stage again in the near future. Let’s hope so!